Phonation, open phase of vibration, under strobe light. 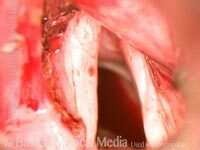 Left-sided cyst (right of image) causes mildly rough voice quality. Four years later. Phonation, open phase of vibration, under strobe light. The cyst has enlarged, and voice quality has deteriorated. 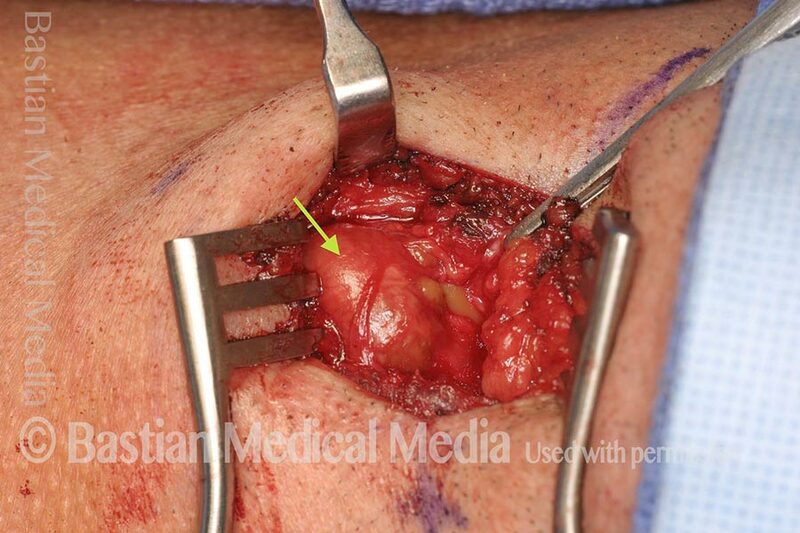 The patient wants this removed. Ten days after laser dissection of the complete cyst (not simple unroofing). At close range, looking into the left ventricle. The raw area (at arrows) is the bed of excision. Phonation, standard light. 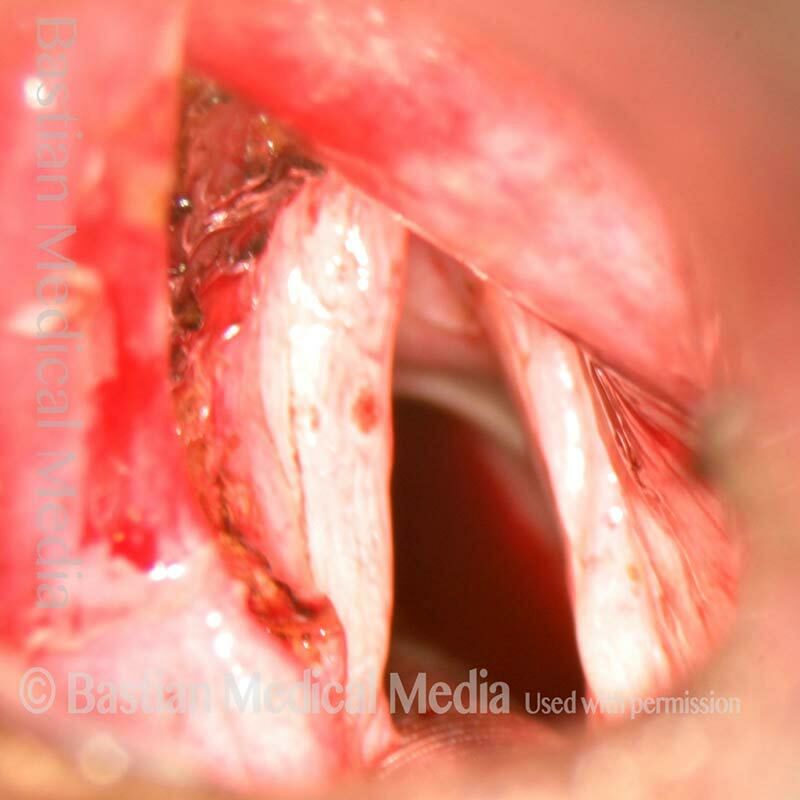 Some residual bruising of the left vocal cord (right of image), but voice quality and capabilities are normal. Bilateral anterior saccular cysts (faint dotted lines), with vocal cords in open, breathing position. 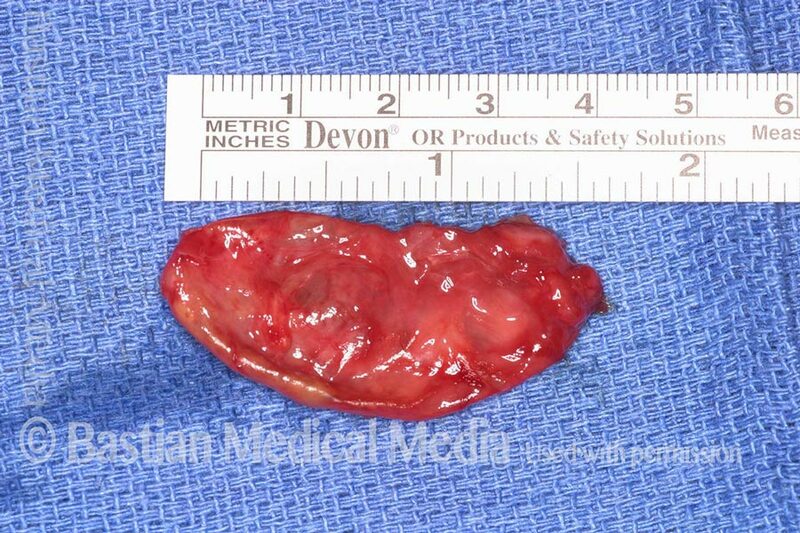 The right cyst (left of image) is larger than the left. These present only into the ventricle, and not significantly upwards into the false cords, nor downwards to press down on the true cords. Phonation, at a high pitch, so that the laryngeal vestibule (the “airspace” above the vocal cords) is mostly open. Voice sounds normal. Phonation at a high pitch again, but under strobe lighting, and at the closed phase of vibration. Note that there is good vibratory closure and that neither cord is pushed down by the cysts; again, the voice sounds normal at this pitch. Phonation at a high pitch again, under strobe lighting, but at the open phase of vibration. Note that the cords aren’t impaired from oscillating laterally; again, the voice sounds normal. Phonation at a mid-range pitch. 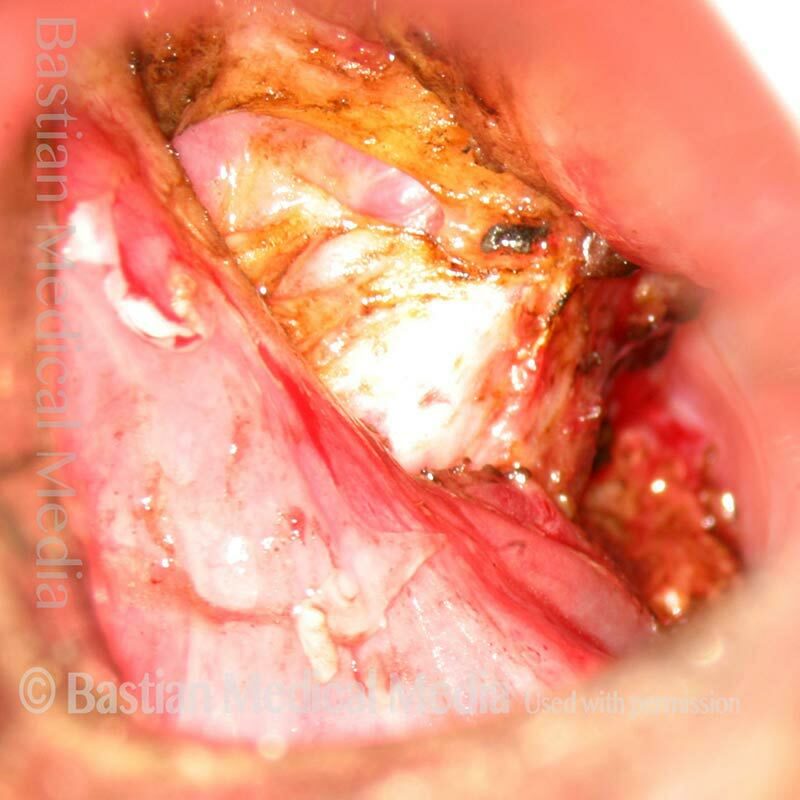 The vocal cords shorten at this pitch, which constricts the laryngeal vestibule (up-down pairs of arrows) and brings the saccular cysts further over the cord (left-right arrows). Voice is still fairly normal. Phonation at a low pitch. The laryngeal vestibule constricts even further (up-down pairs of arrows), bringing the cysts, especially the larger one, further yet over the cords (left-right arrows), so that they interfere more with vibration. Voice at this pitch sounds congested or bottled up. Note margin of false cord, at line of arrows. 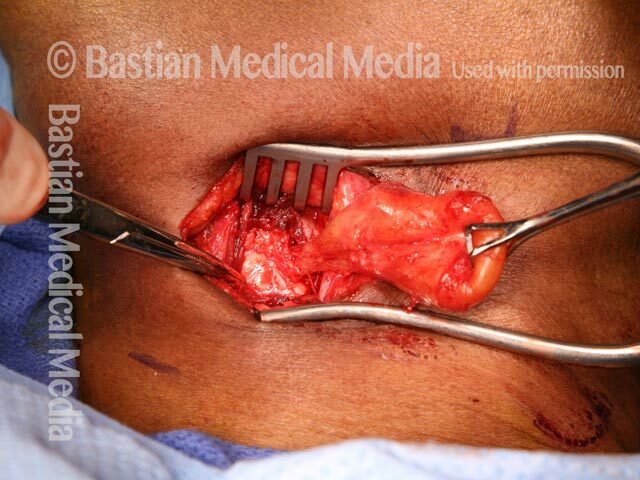 Removal begins by excising the false cord margin in order to dissect downward to the lining of the saccule. 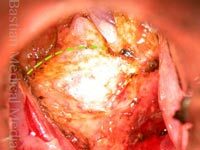 After removal, see upper border of inner surface of thyroid cartilage, at dotted line (distal end of laryngoscope aimed laterally towards neck contents). 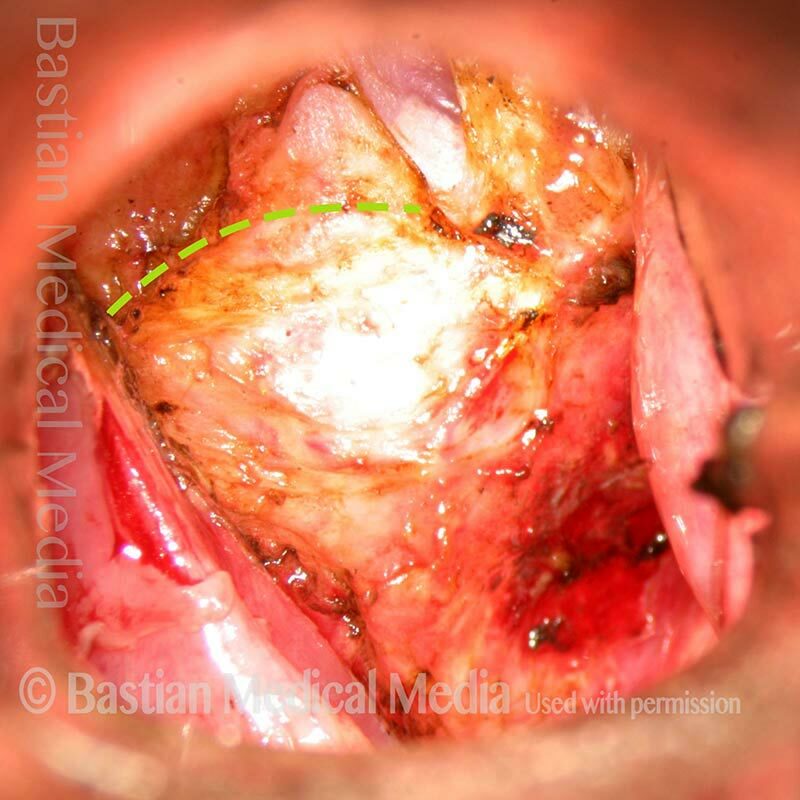 In-line view of vocal cords at conclusion of surgery. Right of photo is superior, at chin. Note dome of cyst at arrow. Near completion of dissection, cyst has ruptured and spilled its contents. 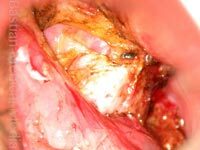 The hemostat in the lower photo points to the upper part of the thyroid cartilage. 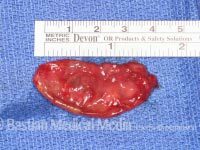 The neck of the sack is being followed over the top of the cartilage and between the thyroid cartilage and soft tissue, to its origin at the ventricle.